The problem with most presentations is the same problem you find with most computer books and columns -- they're boring. If that's been your experience in the past, you haven't seen a Mr. Modem presentation! Click here to read what others are saying about Mr. Modem's seminars and for information about hiring Mr. Modem to speak at your event. All presentations are customized for your specific organization and audience. 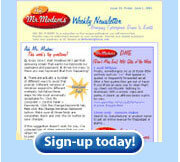 Read Mr. Modem's Desktop each month in Smart Computing magazine, or tune in to Mr. Modem each week on the radio in the PC Chat Computer Show.